In what seems an eternal struggle between the Apps and the Web, the smartphone apps have been increasing its footprint from long. 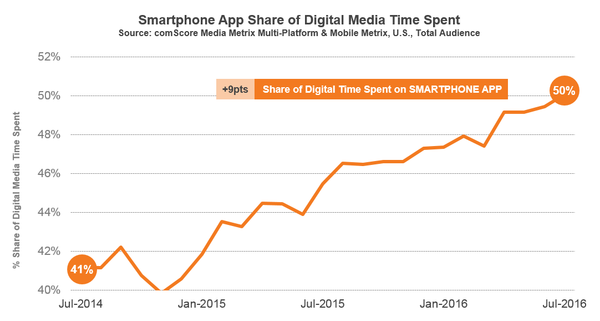 Taking up about 41% of digital media time in July 2014. It was only matter of time before app won. Having taken up 50% of the Americans’ time spent online, according to comScore report in September 2016, app has indeed won, sooner than many estimated. Why Mobile Apps Will Continue to Win? Some tech pundits have been predicting the decline of mobile apps usage, but the trend and increasing share of smartphone apps have proved them wrong. High engagement os users with smartphone apps is just another confirmation that the apps economy, despite its array of issues, is in vigorous health. Both the Apple App Store and Google Play Store is expected to continue to grow. It is estimated that the App Store will have over five million apps by 2020, according to marketing intelligence company Sensor Tower. Adam Lella wrote “In the near term smartphone apps are likely to grow their share of digital beyond the 50% mark, but desktop and tablets will maintain critical roles in consumers’ online consumption for the foreseeable future.” Another recent survey, State of the Mobile Industry 2016, conducted by Open Mobile Media of 700 mobile experts revealed a spirited attitude as to the continued growth of the apps economy. Mobile payments, mobile streaming and the smart home all scored highly in the Open Mobile survey, with customer engagement deemed to be the key factor. At TechAhead we have created many app success stories since 2009. We can convert your idea to an app, and asking for a quote is absolutely free. Contact Us today to get started. A full 50% of all digital media time spent online in the United States is on smartphone apps, with desktop and tablets accounting for 32% and 11%, respectively.